Butterfly clamps (009022): Features Easy to install and positive locking for perfect registration A loose pin permits quick screen removal. Durable and rust-resistant. Parameters Application Thickness of Screen: below 2" (51mm). 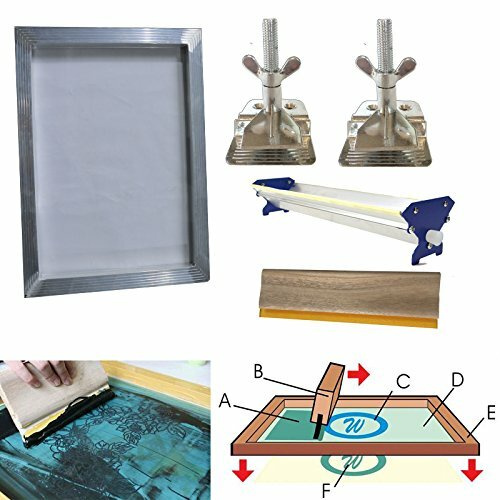 Height: 3.5" (90mm) Length of Clamp: 2.4" (60mm) Net Weight: 0.44Lb(0.2kg) 6.3" /33cm squeegee (007303): 75 durometer for Oiliness Squeegee length: 6.3"/ 13cm Width: 4" Thickness:0.9"
Applications: Printing onto clothing (especially for T-shirts), woven fabric, metal, paper, copybook, plastic, circuit board, wood, glass, ceramic tile, leather and other plain printing substrates. This makes it especially suitable for small businesses as well as individual printing shops.